1 of 3 Heat oven to 200 degrees . In a small bowl, mix yogurt, lime juice, lime zest and 1/4 tsp of the salt until smooth. 2 of 3 Squeeze shredded zucchini in a clean kitchen towel until most of the moisture is absorbed. In a medium bowl, combine zucchini, scallions, 1/2 cup of the cilantro, the egg, flour, remaining 1 tsp salt and the pepper. 3 of 3 Heat 2 tbsp of the oil over medium-high heat in a large saute pan. When shimmering, add zucchini mixture in four 1/4-cup portions. 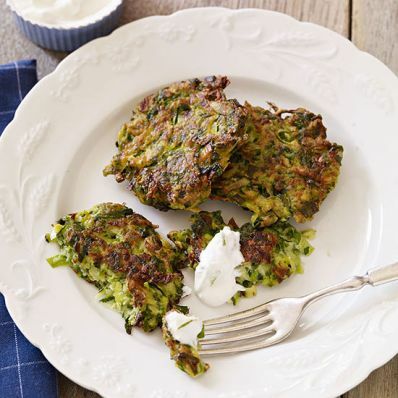 Flatten fritters with a spatula until they are 3 inches in diameter. (It will require 3 batches.) Cook fritters 3 minutes, until browned, then flip and cook another 3 minutes. Transfer fritters to a baking sheet and place in oven to keep warm. Continue cooking fritters, adding 1 more tbsp of oil each time. Serve with lime yogurt and garnish with remaining cilantro. Per Serving: 1 g sat. fat, 5 g Fat, total, 18 mg chol., 3 g pro., 254 mg sodium, 6 g carb., 1 g fiber, 79 kcal cal.